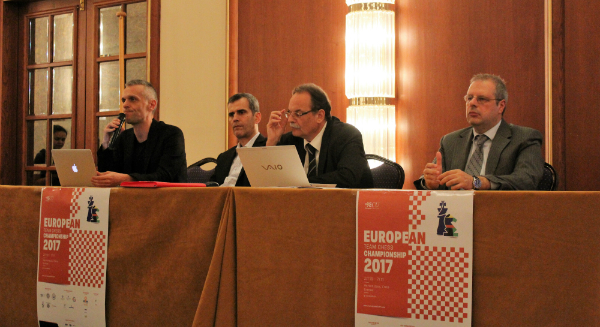 The 2017 European Team Chess Championship was declared open in a ceremony that took place on 27th October in Creta Maris resort in Hersonissos, Crete, Greece. 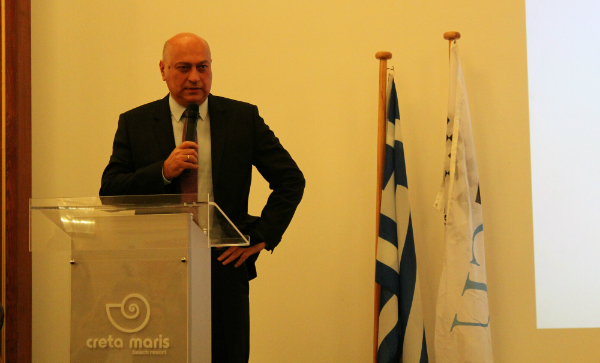 After hearing the anthems of Greece and European Chess Union, the first speaker was Mr.Ioannis Mastorakis, mayor of Hersonissos, who welcomed the players and guests and wished them pleasant stay in Crete. Next followed the video presentations of Crete and the organizational team, and the performance of the local traditional dancing group. Further speeches were given by Mr. Theodoros Tsorbatzoglou, Secretary General of ECU, Mr. Zurab Azmaiparashvili, President of ECU, and Mr. Evripidis Koukiadakis, Vice Governor of Crete. Chief arbiter Takis Nikolopoulos performed the drawing of lots. Russian teams, top seeded in both Open and Women’s sections, will start their round 1 matches with white pieces on top boards. After the opening ceremony, the same hall hosted the technical meeting with teams’ captains. The meeting was run by the Chief Arbiter Takis Nikolopoulos, ECU General Secretary Theodoros Tsorbatzoglou, Tournament Director Nikos Kalesis and Pairings Officer Sotiris Logothetis. 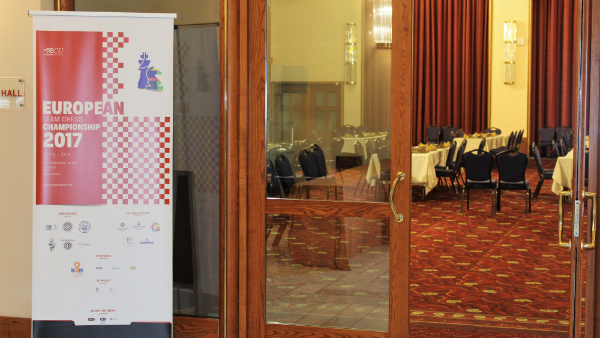 The next round pairings are to be published at most one hour after the end of the last game. 40 teams will compete in Open section and 32 teams in Women’s section. Top seeds in both sections are the teams from Russia who will try to defend their titles as European Team Champions from 2015. Total number of players is 198 in Open section, among whom are 138 Grandmasters and 35 IMs, which is making the event one of the strongest ever! 158 players will play in Women’s section, among whom are 138 International title holders- 13 GMs, 33 WGMs, 31 IMs and 24 WIMs. More information in the relevant sections of the official website and the Facebook page of the event.